Join today and get free shipping if you reside in The United States! Have you ever had to the opportunity to experience other cultures? One of the best ways to do so is trying different cultural foods. The only problem is that it is often times very difficult to even get your hands on hard foreign foods. Luckily, we've got a solution for you. Universal Yums is a snack box subscription company that will ship international snacks and treats to the doorstep of your home or office. Universal Yums was founded by Monique Bernstein in 2014. Her main goal for the company was to bring different candies and snacks to customers that normally would not try or have access to. Continue reading this Universal Yums review to find out if this is the opportunity you have been waiting for! What Makes Universal Yums Unique? Universal Yums separates itself from its competition by paying close attention to cultural immersion. Each month, Universal Yums has a featured country, and each snack that you receive within your snack box is a product of that country. There are two different box sizes with a special assortment of featured snacks. While this takes customization out of the picture, it makes it easier for you. Simply choose the box size that you want and have it shipped directly to you. Universal Yums takes cultural immersion one step further by including a booklet within your snack box that includes information about the featured country, as well as a detailed description for each snack. This gives you a better sense of what you are having, as well as why it is superior than sticking with your usual snacks. Wide variety of snacks from specific countries. You have two different size boxes to choose from. Great packaging including eye appealing colors and snacks that are freshly sealed. Universal Yums includes information booklet so that you know what each snack is, and what ingredients are included. You are not able to customize your snack boxes because they are already pre-made. Snack sizes are not quite as large as other competitors. Universal Yums does not provide options for people who have specific food allergies or other sensitivities. Getting started with Universal Yums is very simple and straight forward. First, visit the Universal Yums website. From there, you will see that you have two options; You have the option to "Get Started" or "Give As A Gift." You will then be brought to a page where you need to choose which size you would like. You can choose between the "Yum Box" and the "Yum Yum Box." Once you make your selection, you will be asked to decide if you would like to pay for a year long subscription or month to month. You then create an account using your email, choose a payment method, and wait for your snack box to arrive to your doorstep! Once you choose the box you would like, you have the option to pay month to month or pre-pay for an entire year. If you decide to pre-pay for an entire year, you get one month free. For the Yum box, you end up being $12.83 per month. for the Yum Yum box, you end up paying $22.92 per month. Even though you do not get to directly choose the snacks that you would like to receive, Universal Yums makes sure that you get a wide variety of snacks. It is also very impressive to have such an extensive variety of snacks from the same country. If you would happen to encounter any type of problem or if you have a question, the best way to contact the Universal Yums customer service team is email. You can send a web based message to them on their contact page or send a direct email to support@universalyums.com. Most people seem to have enjoyed their experience with Universal Yums very much! They have a very extensive selection of international treats for each country, which is impressive, and hard to compete with. There a few weak spots in Universal Yums that many people spoke about, however. First, the boxes are rather small (about half the size of a shoebox), and the snacks within the box are rather small themselves. For the amount of money that you spend, a handful of people were disappointed. Moving on, a few people were also disappointed to figure out that they could not subscribe to Universal Yums because they do not cater to people with food allergies and other food sensitivities. Universal Yums includes a booklet that outlines the ingredients in every snack, but because you cannot customize the snacks that you want included, you are better off not subscribing. You are probably wondering how Universal Yums compares with its competitors. There are many other snack subscription services, but that number narrows when you consider which of those snack subscription services include international snacks. You can customize your snack box if you would like. It costs $0.99 for each snack customization. All snacks come from a specific country that is featured every month. Snack boxes are non customizable. Which has the advantage? That's for you to decide. If you have decided that Universal Yums is superior and would like to give it a try, click here to get started! Cancelling your Universal Yums subscription can be done in two simple steps. First, log in to your account using the login that you created when you first joined Universal Yums. Next, all you have to do is click the "cancel" button which is located right next to your active subscription. Now that you have read this Universal Yums review, you are probably trying to figure out if this is the opportunity for you. Universal Yums is best for those of you who are not only looking to try international snacks and treats, but for those of you who would like to experience other cultures outside of your own. Universal Yums provides an booklet within every snack box that includes information on each snack, ingredients in each snack, trivia on the featured country, and games. Universal Yums, unfortunately, cannot cater to those of you with specific food allergies or sensitivities. If you are looking for a snack subscription service that offers vegetarian, vegan, and many other healthy snack boxes, we recommend Naturebox. Click here to check it out! If you reside in the United States, Universal Yums has an exclusive deal just for you. All shipments within the United States are free of any shipping charges. Also, you can save yourself some money by signing up for a year-long subscription with Universal Yums rather than paying monthly. Although the savings are not too extensive, you still are able to save yourself a little chunk of money. Universal Yums is a great opportunity for those of you who are looking to experience a different culture every month. 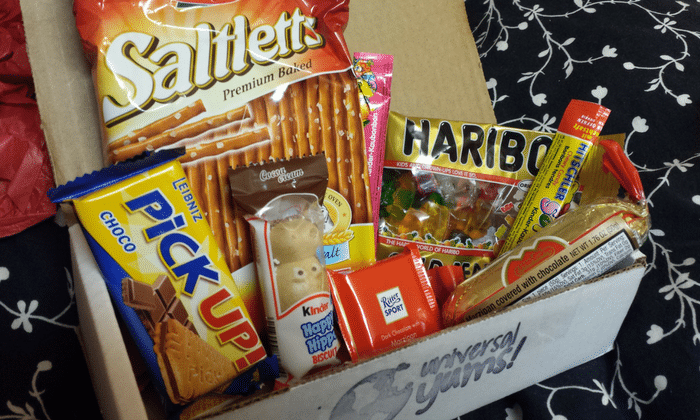 Universal Yums ships international snack boxes that are filled with snacks from their featured country of the month. You will receive your snack box at the doorstep of your home or office. Universal Yums is straight forward and they make it easy to manage your account. Interested in giving Universal Yums a try? Click here to get started. Universal Yums is a snack subscription service that provides great tasting snacks that come specially from each month's featured country. Universal Yums will ship your snack box directly to the door of your home or office. You can choose the size of the box, as well as if you would like to pay yearly or monthly. To top it off, it is very easy to manage your account. Universal Yums is great. Easy to manage my account, great customer service! I love that there is a different featured company every month. They always keep me guessing, which is really fun. You get an interesting look into a different culture. It is completely worth a subscription. Thanks for your feedback, Ralph! Really happy to hear you’re a satisfied subscriber. Universal Yums is so much fun. I think it is such a good idea on their part to feature a different country every month. I can imagine it is no easy task to get treats from different countries. Let alone do it every month with a different country. Props to them! Definitely an awesome opportunity if you are looking to try different foods that you haven’t ever tried, nor will you ever try with Universal Yums. Give it a try! I’ve heard about monthly snack subscription services for a while and decided to try Universal Yums. My kids and I are big time snack eaters and couldn’t wait to try other snacks from around the world. Love the idea of having a booklet about each country too. Thanks, Universal Yums. Can’t wait to see what’s in our next box. Thanks, Tracy for your feedback! So happy to hear you and your kids are enjoying the snacks. I sat down with my sister and we tried our first box of Universal Yums. I’m gonna admit we didn’t like every one but of course we both have different tastes. It’s amazing that you get to try snacks from a different country each month. Thanks for your feedback, Chris! Really happy to hear you’re a satisfied subscriber. I think Universal Yums snacks are wonderful. It’s so amazing trying new snacks from other countries. I really like how they put in a booklet with information about the country and a list of the ingredients in each snack. Hi Amanda, thanks for your feedback!I’m glad you’re enjoying the snacks and also reading the booklet of information provided. Universal Yums snacks are a great way to sample snacks from all over the world. My kids and I are enjoying so many new snacks we would never have known about. Thanks, Universal Yums. Thanks, Jennifer for your feedback! I’m so happy to hear you and your kids are enjoying the snacks from Universal Yums.